Video Editing Apps are commonly used in movie production and they have great features such as converting videos into other formats of media players in such a way that other portable device can easily access such file. With video editing apps, you can easily cut movie clip and merge others into one with extra effects being added. Video editing apps also helps in terms of copyright protection by implementation of watermark into your vidieo and so many other great benefits of video editing apps. Today's stroll, I would brief you guys on the 5 Best Free Video Editing Apps For Androids. Magisto Video Editor is an impressive video editing app that helps analyze and spice your video and photo together for you. With Magisto Video editor, you can create a professional movie and edit a lovable videos that could be shared to your friends. Magisto Video editor also serves is an ultimate alternative to instagram that is used by over 30 million users and also makes video editing very much easy. I would recommend every android user to utilize this app, it's a must-have video editing app with interesting features as stated above. Viddy Video Editor is another exclusive video editing app that lets you Edit and beautify videos with the coolest video effects and also enables you embed soundtracks to your favourite videos. One good thing about viddy is that, it makes you engage with your firends on viddy by liking and commenting on their videos, and trended videos are being released on viddy. Imagine when your edited video becomes trended, that's pretty cool. So I would do encourage you get viddy on your android smartphone or tablet. Androvid Video editor is one of the most unique video editing app which is very intuitive to use and used for creating professional movies in few minutes. With Androvid Video editing App, you can easily add transitions, effects and more on your video, even crop and ken burns effect can also be added to your video tracks. The Androvid Video edting app also has an easy-to-use navigation and well positioned layout. You can also upload your edited video to youtube from androvid video editor. Androvid Video Trimmer is an extracool video editing apps tha easily trims your videos and produce clips, it also lets you add music and replace existing audio in the any video you wish to edit. You can also merge multiple videos into one and also remove and replace any part of a video (i.e middle part). The Androvid video editor also lets you add video frames, texts, effects, make slideshows and also converts video files to Mp3 audio file. Get Androvid Video trimmer for your android and make, edit and upload your video to social medias. Video Maker Pro is a Free Video editing app that helps in the creation of professional videos within few minutes. With video maker pro, you can easily insert background music to videos, insert video frames, make multiple pictures as slide shows, and it also trims your video creation. 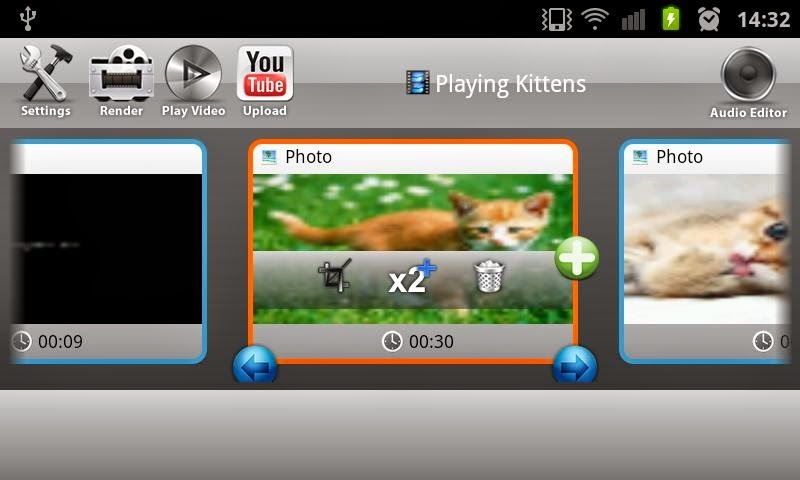 The above Video editing Apps highlighted above are very recommened for Android users with impressive features. So I'd advice you download any of the Video editing apps that best suites your android device. If there is any other video editing app you feel that is also cool, you can make your suggestion at the comment section, meanwhile, hope the above stated video editing apps helps. Thanks for sharing these editing apps, now I can edit videos on the go. Awesome writeup...I have used the first and it worked really well. I'll try the remaining one soon. Thanks for sharing the informative post. Everyone loves editing the videos, but it is very different from photo editing. The user needs very efficient applications for doing it. You have shared very nice post and listed good editing apps. I used some of them on my device and edited my videos. Thanks for sharing such a useful post. Newbies always think video editing very challenging task but above described apps will make it easier. I found another nice write up on guruswizard.com. Great apps man!! Do you know about the video editing apps for iOS? ?